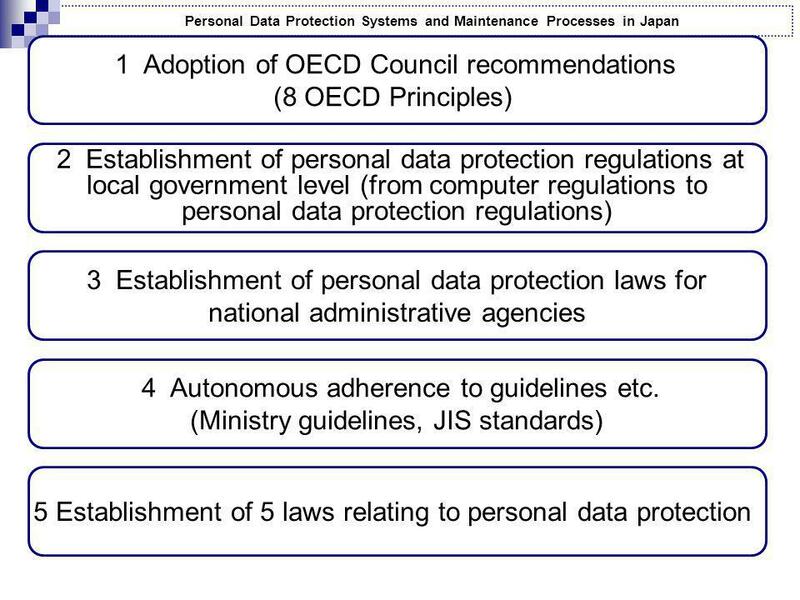 OECD Privacy Guidelines and Japan March 10, 2010 Dr. Fumio SHIMPO Associate Professor Graduate School of Media and Governance Keio University Faculty of. 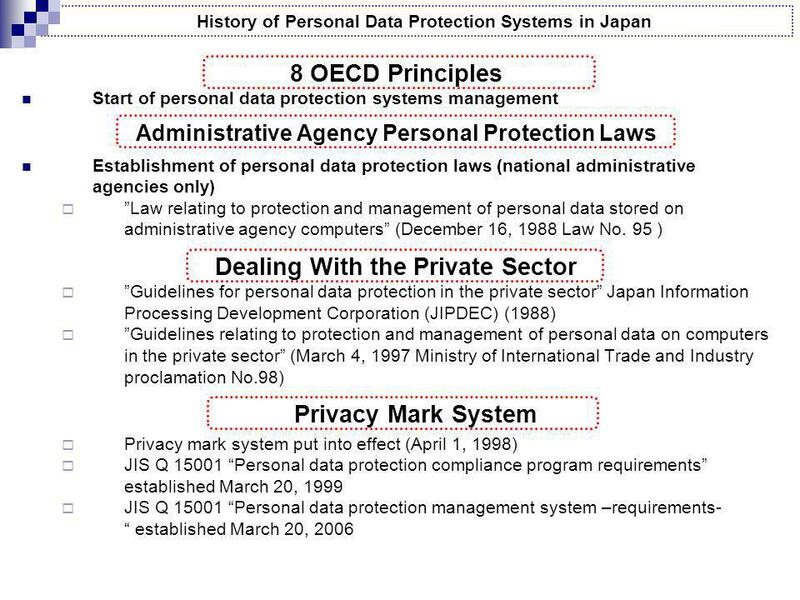 5 History of Establishment of Laws Relating to Personal Data Protection (Japan) July 14, 1999 Agreement on formation of Personal Data Protection Investigation Unit (Chairman: Masao Horibe, Professor at Chuo Universitys Faculty of Law) October 20, 1999 Announcement of Regarding Protection of Personal Data (Central theme: Chairmans plan) November 19 Announcement of State of Personal Data Protection systems in Japan by High-Tech Telecommunications Society Promotion Committees Personal Data Protection Investigation Unit (mid-term report) February 4, 2000 Formation of Personal Data Protection Legislation Specialist Committee (Committee Chairman: Itsuo Sonobe, Associate Professor at Ritsumeikan Universitys Graduate School) (Session No.28) October 11, 2000 Agreement on Fundamentals Relating to Personal Data Protection Laws Drawing up of proposed legislation in accordance with fundamentals. 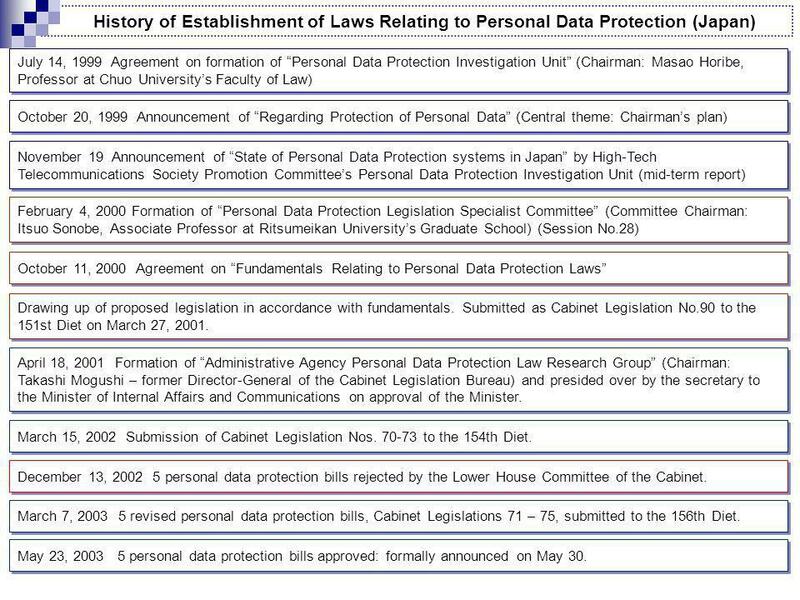 Submitted as Cabinet Legislation No.90 to the 151st Diet on March 27, 2001. 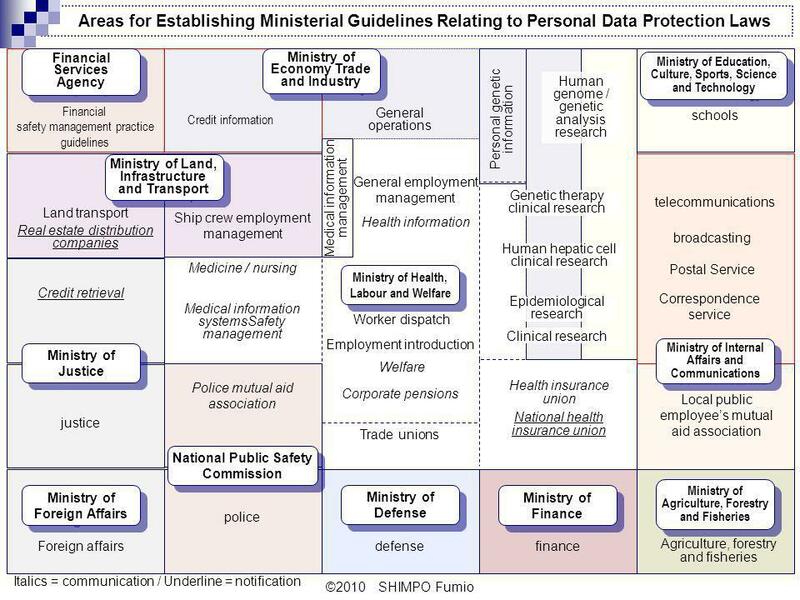 April 18, 2001 Formation of Administrative Agency Personal Data Protection Law Research Group (Chairman: Takashi Mogushi – former Director-General of the Cabinet Legislation Bureau) and presided over by the secretary to the Minister of Internal Affairs and Communications on approval of the Minister. 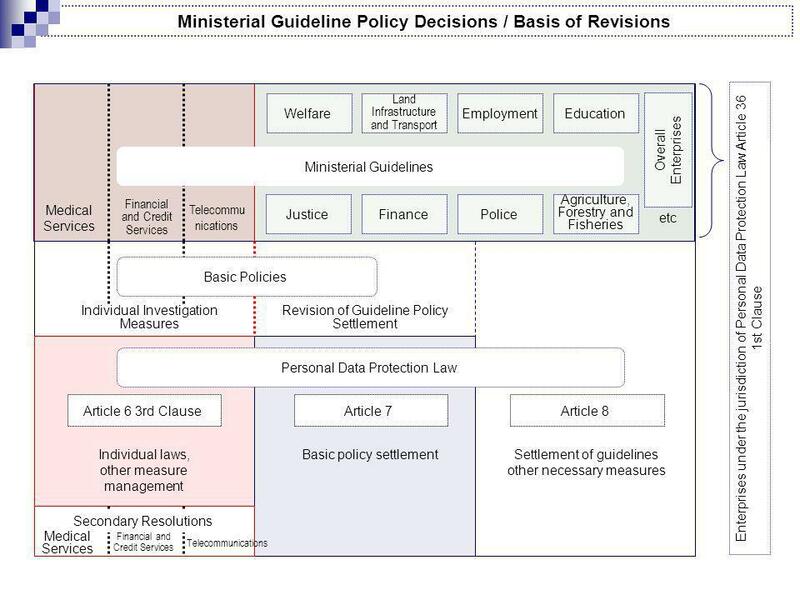 March 15, 2002 Submission of Cabinet Legislation Nos. 70-73 to the 154th Diet. 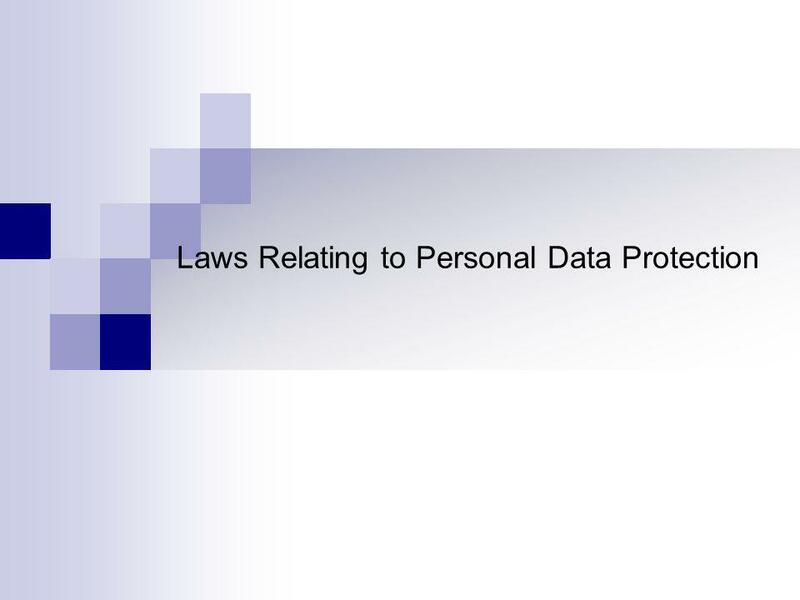 December 13, 2002 5 personal data protection bills rejected by the Lower House Committee of the Cabinet. 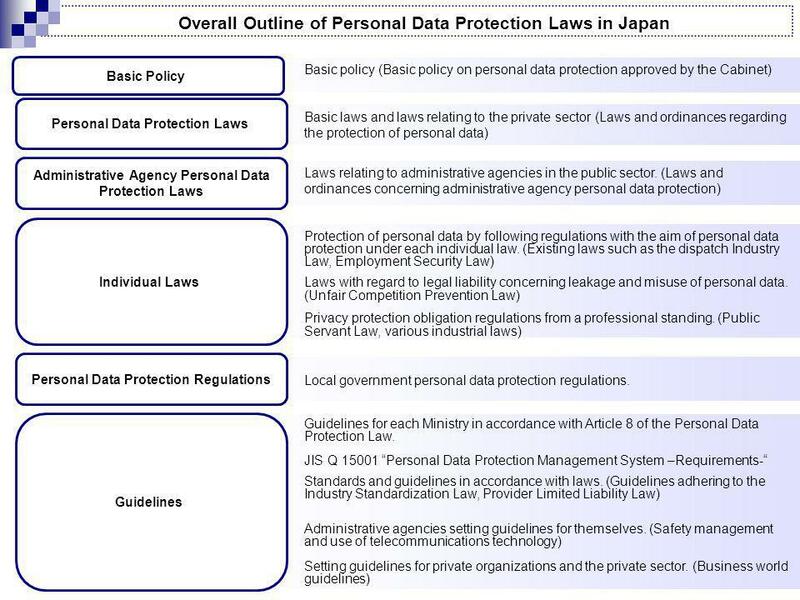 March 7, 2003 5 revised personal data protection bills, Cabinet Legislations 71 – 75, submitted to the 156th Diet. 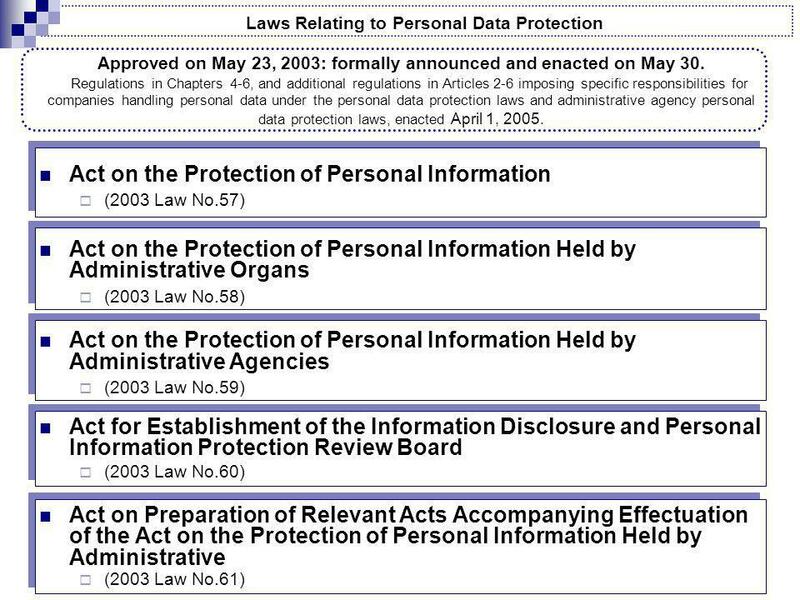 May 23, 2003 5 personal data protection bills approved: formally announced on May 30. 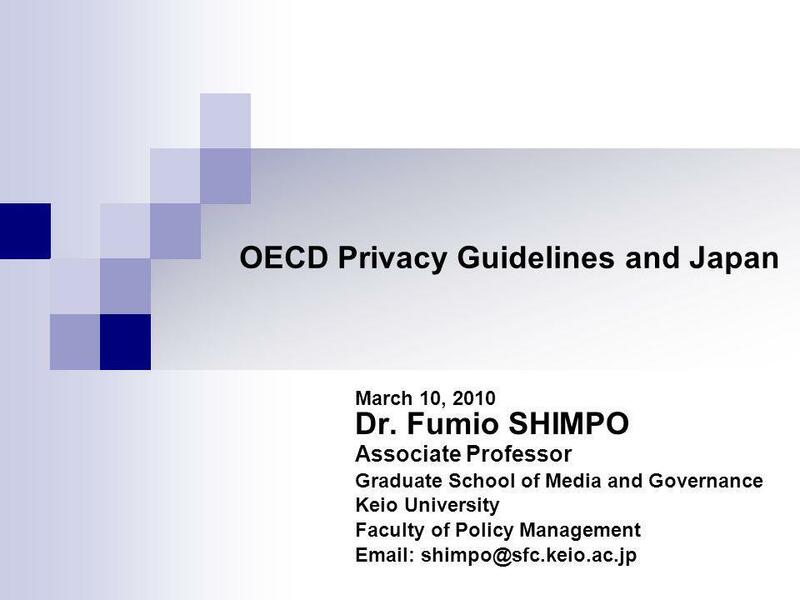 Download ppt "OECD Privacy Guidelines and Japan March 10, 2010 Dr. Fumio SHIMPO Associate Professor Graduate School of Media and Governance Keio University Faculty of." Towards a Monetary Union for GCC Nasser Al Kaud The Cooperation Council for the Arab states of the Gulf Europe,the Mediterranean and the Euro Conference. 1 PROGRESS ON INSTITUTION BUILDING Mr. Adnan Terzić, Prime Minister of Bosnia and Herzegovina International conference on development of Bosnia and Herzegovina. Republic of Moldova Nuclear and Radiological Safety Regulatory Infrastructure in Republic of Moldova Ionel Bălan, National Agency for Regulation of Nuclear. Regional Workshop Warsaw, 18-20 January 2006 STATE UNION OF SERBIA AND MONTENEGRO Basel Protocol on Liability and Compensation Questionnaire No. 2 Ratification.